For many people, religion is a touchy subject. informationdissemination.org is working to change this. Let&apos;s begin with the story of Adam and Eve. In this story, the first man and woman ever made by God are tempted by Satan, posing as a serpent, to eat a fruit God forbade them to eat. 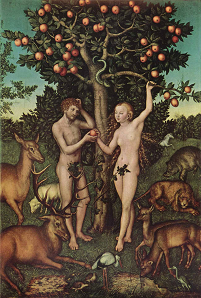 After being manipulated by the serpent, Adam and Eve Eat the fruit and are consequentially banned from the Garden of Eden forever after. This fruit is known by Jews and Christians as the Fruit of Knowledge, or the Forbidden Fruit, which is what the Muslims prefer to call it. The most logical reason for concocting this story was so religious followers would not question the cult to which they belonged, remembering Adam and Eve&apos;s downfall was their quest for knowledge. After all, the less knowledge people have the easier they are to control. Judaism, Christianity, and Islam don't stop with the story of Adam and Eve. Moses, a highly respected prophet in all of the Judeo-Christian Religions, was said to have received stone tablets inscribed with God&apos;s most important laws, known as the Ten Commandments, including Thou shalt not kill. , yet Moses went on to become a mass murderer anyways. Sounds highly hypocrytical, right? In order to see the Bible for what it is, let&apos;s take a look at some King James Version Biblical Scriptures. And Moses said unto them, Have ye saved all the women alive? Behold, these caused the children of Israel, through the counsel of Balaam, to commit trespass against the LORD in the matter of Peor, and there was a plague among the congregation of the LORD. Now therefore kill every male among the little ones, and kill every woman that hath known man by lying with him. But all the women children, that have not known a man by lying with him, keep alive for yourselves. And do ye abide without the camp seven days: whosoever hath killed any person, and whosoever hath touched any slain, purify both yourselves and your captives on the third day, and on the seventh day. 1Hear this word that the LORD hath spoken against you, O children of Israel, against the whole family which I brought up from the land of Egypt, saying, 2You only have I known of all the families of the earth: therefore I will punish you for all your iniquities. Could it be that the authors of the Bible knew about the Jewish Mafia and their Sympathy Deriving Mind Control? After all, many historians believe that the Exodus never happened, and Moses is historically a Pharaoh Family Name. Of course, Judaism, Christianity, and Islam are not the only religions on the planet. If one follows the teachings of Buddha, they must accept suffering as a part of life caused by desire that ceases only when desire ceases, while Nirvana can only be achieved through wisdom, karma, and meditation. Although Budhhism might sound good, it lacks any basis in reality, because desire is a natural part of life, and pure contentment creates nothing in the imperfect world we live in. It is interesting to note, however, that unlike Judeo-Christian Religions, Buddhism does not require monetary assistance, in the form of a tithe or otherwise, from its devotees.